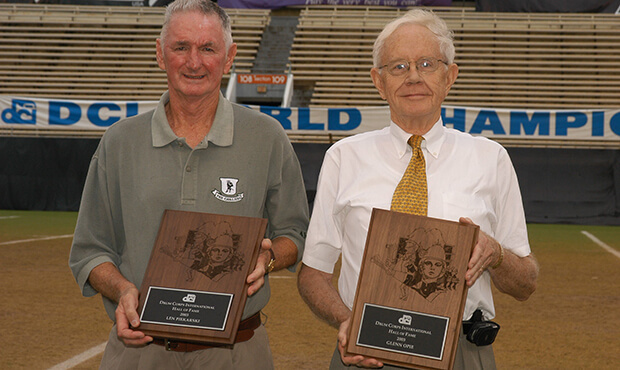 Hall of Fame members Len Piekarski (L) and Glenn Opie are recognized at the 2003 DCI World Championships in Orlando. Drum Corps International Hall of Fame member Len Piekarski passed away earlier this month. He was 88 years old. A member of the DCI Hall of Fame Class of 2003, Piekarski lived a live of service to others and especially to drum corps, joining his first corps in 1933 at the young age of seven. Piekarski joined the U.S. Navy at the age of 18 and served on a ship in the Pacific Theater during World War II. Upon returning from the war, he continued marching and became an instructor with the Skokie Indians Senior Corps while still a member, helping lead the corps to three American Legion Senior Championships in the mid-1950s. Having been introduced to Cavaliers founder Don Warren by the legendary drum instructor Frank Arsenault, who was working with both the Skokie Indians and Cavaliers, Piekarski became the Cavaliers' drill instructor in 1956 and wrote the corps' visual program from 1957 through 1968. During his tenure, the corps won the VFW National Junior Corps Championships in 1957, 1959, 1961 (an undefeated season), and the years 1962, 1963 and 1967, as well as the American Legion National Junior Corps Championships in 1967 and 1968. Piekarski's work in turning the corps into meticulous marchers resulted in the corps winning a staggering 80 percent of its competitions during those years. PIekarski joined the U.S. Postal Service in 1952 where he served as a letter carrier for 40 years. Cavaliers alum Dave Davis, who came into the corps in 1967, remembers Piekarski telling stories of writing drill ideas on the back of envelopes while on his route. After delivering the mail he'd ask the customers if he could have the envelopes back so he could incorporate those sketches into his drills. Patrick Jones, another Cavaliers alum, remembers Piekarski getting his best ideas on the spur of the moment. "He would be in the middle of a conversation, then get this look on his face and start scribbling drill ideas on a napkin or whatever scrap of paper he could get his hands on," Jones said. In Piekarski's DCI Hall of Fame nomination letter, Don Warren wrote, "It was due to Lenny's drills that fans gave the Cavaliers the nickname 'The Green Machine.'" Continuing to attend drum corps shows throughout his entire life, Piekarski had no problem keeping up with the evolution of drum corps in recent decades. Prior to his induction into the DCI Hall of Fame he said, "DCI corps are fantastic! I couldn't even approach the level they work at. Their marching is fantastic." Piekarski is survived by his wife of 61 years, their five children and numerous grandchildren. Memorial contributions can be made to the Special Operations Warrior Foundation and the United States Navy Memorial. A profile of DCI Hall of Famer Len Piekarski Piekarski, Opie inducted into Hall of Fame Obituary for Leonard Joseph Piekarski Special thanks are extended to Les Dlabay, co-nominator of Piekarski to the DCI Hall of Fame, for supplying much of the above source information.